PHOENIX — An earthen dam in Arizona’s southern desert could fail because the lake behind it is swollen with storm runoff, and more flooding caused by rain from the remnants of Tropical Storm Rosa is possible elsewhere in the state, officials said Oct. 3. Residents who live near the dam in the small Native American community of Ali Chuk on the Tohono O’odham (TOH’-oh-no OH’-tum) Nation reservation near the U.S.-Mexico border were being evacuated the night of Oct. 2, the tribe’s public safety department said in a statement. Tribal spokesman Matt Probst did not immediately respond Oct. 3 to phone and e-mail requests seeking comment. The remnants of #Rosa will bring heavy rains and flash flooding to our region. Water levels were within 1 foot of overtopping Menagers Dam, which could give way and flood Ali Chuk, the National Weather Service said. Rob Howlett, a weather service meteorologist in Tucson, said there were no reports of additional rain in the area Oct. 3. Flooding from runoff Oct. 2 made roads impassable in the area, the tribe’s public safety department said. The Arizona Daily Star reported that Ali Chuk has a U.S. Census-reported population of 162 and that the area got 3 to 5 inches of rain Oct. 2. The tribal department’s statement said officials evacuated more than 30 people from a village elsewhere on the reservation because of flooding. 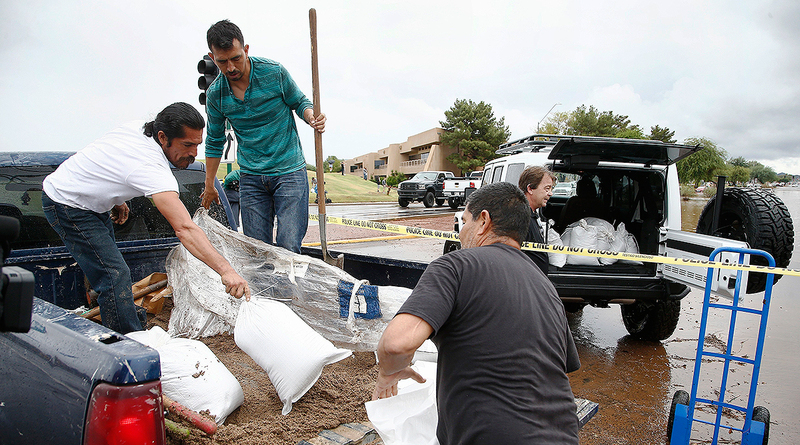 Forecasters also warned of the possibility of more flooding in the Phoenix area and elsewhere in Arizona on Oct. 3. The weather service said up to 1 inch of rain already had fallen in the parts of the county that includes Phoenix and that flash flooding was expected. A separate flash flood warning was issued for Yavapai County north of Phoenix due to high water flow in a creek in the small community of Cornville and for a small part of the Tohono O’odham Nation’s reservation in Pima County in southern Arizona. A flash flood watch issued for much of south-central Arizona was extended through the afternoon of Oct. 3. The storm remnants dropped a record amount of rain on Phoenix on Oct. 2. The weather service said 2.35 inches of rain had been recorded at Phoenix Sky Harbor International Airport as of Oct. 2. That made it the rainiest October day since records have been kept, topping the 2.32 inches recorded Oct. 14, 1988. It also marked the eighth-rainiest day in Phoenix’s history for any date. The storm remnants were expected to bring rain to Utah and Colorado.